Grunion runs are blasting the beach and there’s no time like the present to get down there and hunt for halibut. Spring brings both the spawning time and massive balls of grunion together to drive flatties crazy. Now’s the time to get your equipment together to have a least a fair chance of catching a keeper. 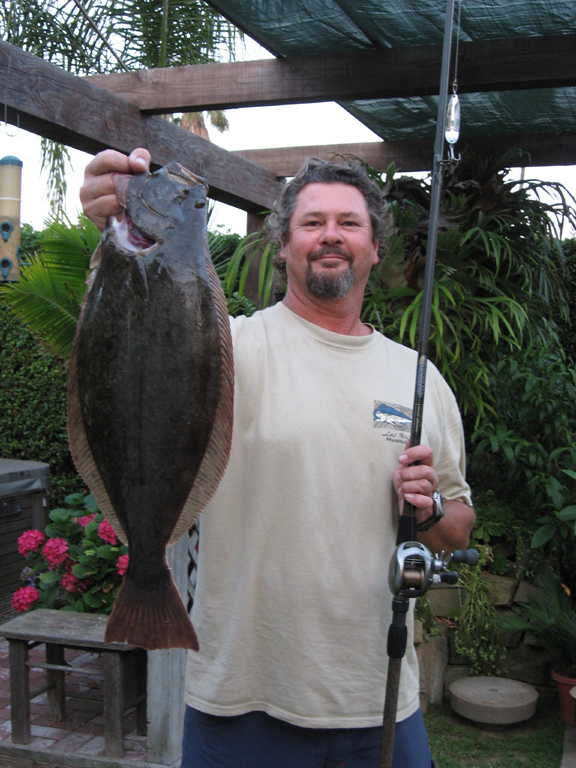 Here are my recommendations of what I like to use in the surf for halibut. Rod, reel, rigs and bait all work together to make you a better surf angler. Take these ideas and customized them to your style and situation. I like to start out with two rods for the surf. A 7’ – 9’ light action parabolic graphite rod and spinning reel for bait fishing and a medium action fiberglass casting rod matched with a bait caster for lures. When it comes to halibut rigging I use two basic setups. The first is the Carolina rig which works best with bait (and also has some lure applications). The second rig is a lure tied directly to my monofilament mainline. Carolina rigging consists of a sliding egg sinker, bead, swivel, 18”-36” fluorocarbon leader and a hook. In small surf a ½ ounce egg sinker works well. In bigger surf or when fishing in the wind use a ½ – 1-ounce or sinker to keep your bait on the bottom. The second setup I use when fishing with lures is either a straight connection of the lure to my mono or using a uni to uni knot to connect my main line to 10lb fluorocarbon leader and then tying on my lure. Fluorocarbon leader is a good idea whenever I’m fishing near rocks or over structure. Fluorocarbon allows me to use a heavier leader and it’s much more abrasion resistant than monofilament. Without question hard baits are one of the most productive surf lures. I use the Lucky Craft FM 110, Rapalla SXR-10 XRAP and Infinity jointed lures. These lures are best cast out and retrieved with a stop and go motion. They should be tied straight to your main line or onto a short uni to uni connected fluorocarbon leader. Most halibut move slowly so a fast retrieve may pass the fish by. A fish attractant applied to your lures will also help to attract fish and make them hold on once they bite. To fish hard baits effectively try this: Cast your bait out in a fan motion to cover as much surface area as possible. Once you cast out reel up all your slack and pull your rod hard to the side (in a snagging motion). This will drive the bait down to the strike zone. Vary your retrieve with slow, fast and a stop start motion. Be sure to slow your retrieve way down once you are about half way in so the lure does not come in contact with the bottom. Once you get a bite reel down to set the hook. When it comes to spoons the two most effective for the surf have always been Luhr-Jensen’s silver Krocodile and the Acme Kastmaster. These lures are easy to use and should be tied directly to your line. A good size to use is one between 5/8oz and 1oz. A long fan casting pattern and a slow retrieve, with the lure bouncing across the bottom, seems the most effective presentation. 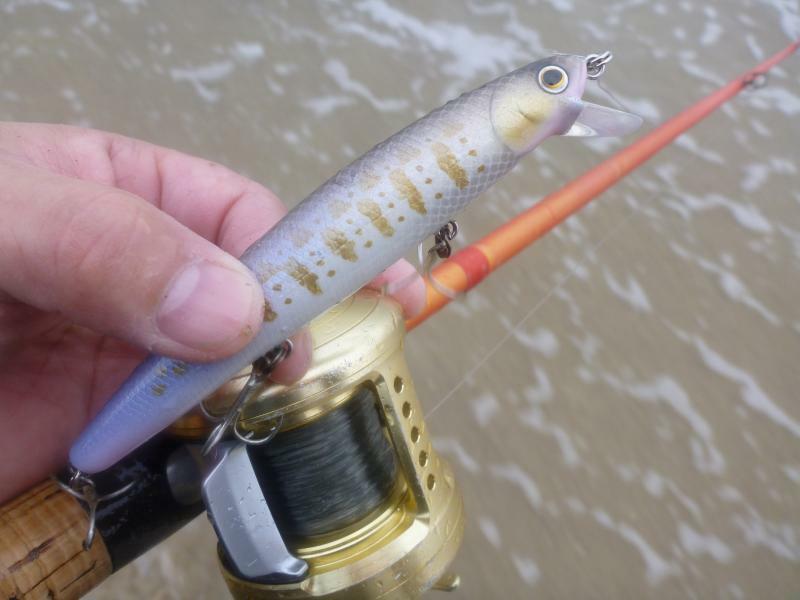 Fishing spoon lures at peak low tide will allow you to cast outside the surf line to offshore structure and holes. Or, fish these lures at high tide and you can concentrate on the inshore trough where halibut hunt for food. Grubs and plastic lures also work great in both the open beach and near rocks for halibut. Two styles of plastics seem to work best in the surf. The first, known as a grub, is in the shape of a pollywog. Most grubs in the 1 ½” to 3” range seem to work best. Attach grubs to you line using the Carolina Rig. Look for colors that imitate what the halibut are eating. Common colors are motor oil, white, smelt and grunion patterns. Unlike grubs, plastic swim baits can be tied directly to your mainline. Use a leadhead that matches the size of your bait and the current you will be fishing in. Once again remember to keep your bait in contact with the bottom and don’t be shy from dunking your plastics in “hot sauce” to attract and catch more fish. The best colors for finding halibut have been the colors that reflect what the fish have been eating: Sardine, anchovy, smelt, grunion and squid. Drop shot and twitch baits are made of the same material as plastic baits but require different rigging. These baits are a true crossover from fresh water bass fishing and have become very effective when used in the surf for halibut. Look in your local tackle shop for Basstrix and Sluggo products. Rig the twitch bait with either a small 1/8th leadhead (or the new Mustad “Power Lock” weighted hook) and tie it directly to your line. You may also rig it using the drop shot method. The drop shot rig is simply a sinker on the very bottom of your line and a loop 12” – 24” up your line for the hook and bait. When using the drop shot rig, don’t tie the lure directly to your loop. Run the line through the hook’s eye and allow the lure to slide freely on the loop in your line. This will give the bait a much more natural look and help you to entice more fish to bite. Twitch baits work best when they are cast out and retrieved slowly using stop and go then twitch motion. When using the drop shot rig try to find the lightest sinker you can use and still stay on the bottom. This will help to reduce the number of snags and tangles in the rocks. Look for lure colors that reflect what the fish are eating and fell free to use the “hot sauce” on these baits too. There are many types of live bait locally available for use when targeting halibut in the surf. Live, fresh dead or unfrozen sardine, anchovy, smelt and grunion all work well in the surf. Additionally, strip mussel lip, threaded on the hook like a worm, is natural bait for halibut and also seems to work well when the bite is tough. Use either a spinning or conventional outfit and the Carolina Rig. I like to hook my baits (anchovy, sardine, smelt, grunion) through the bottom and top lip with my hook to be sure they swim correctly and give the most natural presentation. Fishing with natural baits requires a much slower retrieval and periods of stop and start that allow the lazy halibut to catch up with their next meal. Both anchovy and sardines can be purchased at your local tackle shop or at a quality fish market. Smelt and grunion can be caught by anglers and kept alive or fresh dead for bait. You’ll find smelt near docks, inlets and inside local harbors. They can be caught with a bait catching rig or a dip-net using breadcrumbs. Bill Varney’s passion for surf fishing is detailed in his how-to book: Surf Fishing, The Light-Line Revolution available at most tackle shops and on line @ www.fishthesurf.com. Check out Bill’s upcoming on-the-beach surf fishing clinics under the “Seminar” tab on his site.